Every year the results of the market survey into the number of sold devices for the technologies of PI (PROFIBUS & PROFINET International) is eagerly awaited. More recently, IO-Link has been included in the notarized statistical analysis of the number of installed nodes in the field. After a surprisingly high number of installed nodes was reported in the first survey for 2014, the rate of increase in the 2015 survey surpassed all expectations. With over 3.5 million nodes in the field, an increase of 63% compared to the prior year (cut-off date: December 31, 2015) was achieved. Companies especially appreciate the easy installation and parameter assignment of IO-Link as well as its fieldbus neutrality. The fieldbus-independent IO-Link standard is thus the ideal solution for many companies that allows them to connect products to different systems and controllers worldwide. Accordingly, IO-Link has been implemented in almost all fieldbus systems established in the market. This also applies to almost every well-known PLC manufacturer. 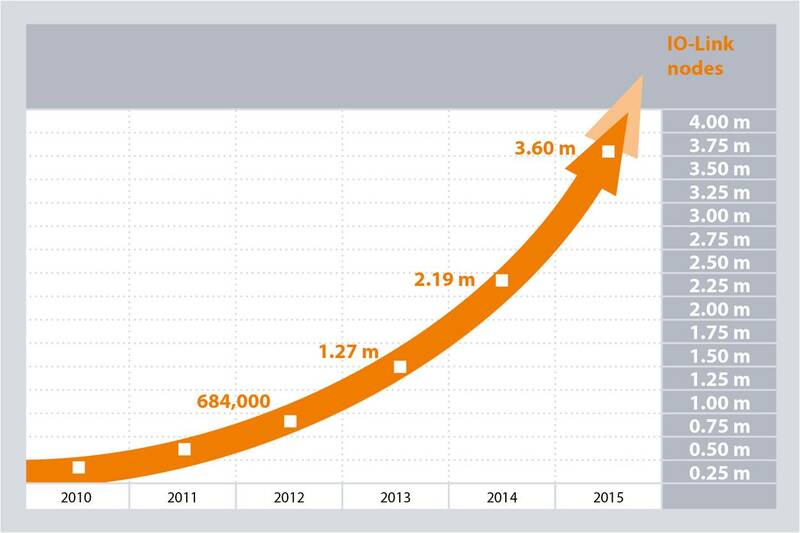 The success of IO-Link is also demonstrated by the unabated growth in the number of members within PI’s IO-Link community. In 2015 alone, 29 companies joined the IO-Link community. This trend is continuing in the current year. So far this year, more than 10 companies have elected to collaborate with IO-Link and to bring products into the market, increasing the total number of companies active in the IO-Link community to 124 (at start of April 2016). The increased number of member companies corresponds directly to the growth of the portfolio. The number of different products with IO Link technology grows daily. IO-Link is future-proof. Consistent communication from the ERP level to the sensor level is essential for Industrie 4.0. With IO-Link both cyclic and acyclic data exchange with the higher levels is possible. For example, it is possible to load configuration data in the sensor or actuator or vice versa, to deliver diagnostic or statistical data. Because IO-Link is integrated worldwide in all major automation systems, the connection to the ERP level is already possible today. As a result, IO-Link is the only technology for the kind of intelligent connection of sensors and actuators that is essential for a digital factory. In other words, with IO-Link the user is ideally prepared for the requirements of Industrie 4.0.